Part two of a three part review! Part one was about the Winged Dice and part three will be about the Spellbook Game Box. Whether you get a set of Elderwood Academy’s dice (reviewed in Part 1), or already have a favorite set, you need something to keep it in. You could keep them in the box or bag they came in, or you could opt for something more durable and cooler looking, especially if you’ve gotten a set that is fancier than the basic, plastic dice your FLGS sells from random piles. One of many options is Elderwood Academy’s Hex Chest Dice Box. As the name suggests, the box is six sided and is 3.25”x3.25”x1” in size, small enough to fit comfortably in our hands or a jacket pocket. The Hex Box is relatively light, but feels strong and well made. The wood’s finish feels smooth, but not slippery. The lid fits snugly to the bottom with clean sides, free of hinge or clasp. That’s because two strong neodymium magnets hold it on. It takes a little effort to pull the lid off, but is not too difficult. Inside, the lid is lined with soft, gray foam and you can see the magnets as two shiny, chrome-looking circles securely screwed in place. The lid is only 0.25” thick, leaving a deep box bottom for your dice to sit in. Perhaps a bit too deep, as we had a little trouble picking the dice, especially the D4 and D10, out of the honeycomb of seven hex shaped holes in the box bottom. If the holes were a little bigger, or the bottom a bit shallower, it might be easier. The bottom of the honeycomb is not lined with foam or felt, allowing the dice to rub on the wood. This is fine for plastic dice, but metal dice, especially ones with the sharper edges and corners, might scratch up the holes’ finish over time. If they lined the holes, and/or made them bigger, they might have to make the whole box a little bigger. The dice only rattle around inside the holes when the lid is off as the foam seems to hold them still with the lid on, but that could change as the foam wears. On the website, there’s also an option of getting the interior without the honeycomb, allowing the box to hold up to twice the dice. That’d be fine for plastic dice, but metal dice might rub on each other, causing scratches. Speaking of options, they don’t stop there. Our Hex Box came in what we think may be bloodwood (which is an actual kind of tree, not just a stain – Brosimum rubescens), but you can also have it in nine others such as cherry, birdseye maple and walnut. Some are more costly than others, starting at $39 for more common woods like cherry, $59 for birdseye maple, $75 for redheart (also a real wood – Erythroxylum or Simira spp.) and up to as much as $99 for rare woods like our bloodwood. The lid can be laser engraved at no extra charge with 34 different designs. Ours came with Fire-flower, which looks great. Eleven of them are emblems representing RPG character classes and would be great gifts from a DM to long-time players. Some designs are simple, like the skull, while others are incredibly complex like the Mayan calendar. You can also get it plain or with three choices of borders. The sides can also be engraved with eight designs. $5 for small symbols like a shield or script, or $20 for more elaborate designs like spell circles or lotus blossoms. 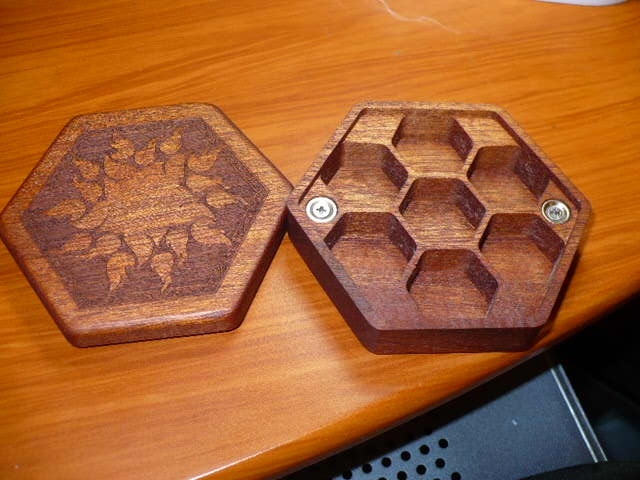 With both the lid and sides engraved, the Hex Box would look quite special indeed. There’s also the ‘Remastered’ version of the Hex Box that have the magnets covered with an engraved wood inlay and a leather lined lid interior. Judging by the pictures on the website, it looks like the lid is thicker and the dice holes shallower than the original box, which might make this design the one to get for people with large fingers. These are $90 regardless of options chosen. For some reason, you can’t have the sides engraved in this set. For $135, there’s also the Elite set, which is similar to the Remastered set, only the lid has eight designs to choose from that are hand-inlaid with maple rather than just laser engraved. Stay tuned for Part the Third – The Spellbook Game Box! https://uploads.disquscdn.com/images/8cf2709e551f53a25709ac1a268037ebb5e47ab4e10da8c024758dd18a95eb6a.jpg Update: Unable to resist the temptation any longer, I’ve applied a thin coat of grapeseed oil to the wooden surfaces of the Hex Chest Dice Box. The finish, as it came to us, was so dry and a bit dull, that I felt I needed to do something to protect the wood. I live in the Mojave Desert here in Las Vegas, myself, so I’ve learned that the really low humidity here will eventually dry out and ruin wood if you don’t protect it somehow. I’ve tried many things over the years, including all sorts of products specially made for applying to wood, but I’ve wound up preferring the ‘old school’ ways of using various seed oils. I now usually use olive oil or grapeseed oil and have very good results. The grapeseed oil doesn’t make the surface feel oily once you buff it a bit with a clean cloth. Look how much the oil brings out the color and wood grain. Looks more like the photos on the website now.